Blueshirts have won three straight and four of five entering the All-Star break. 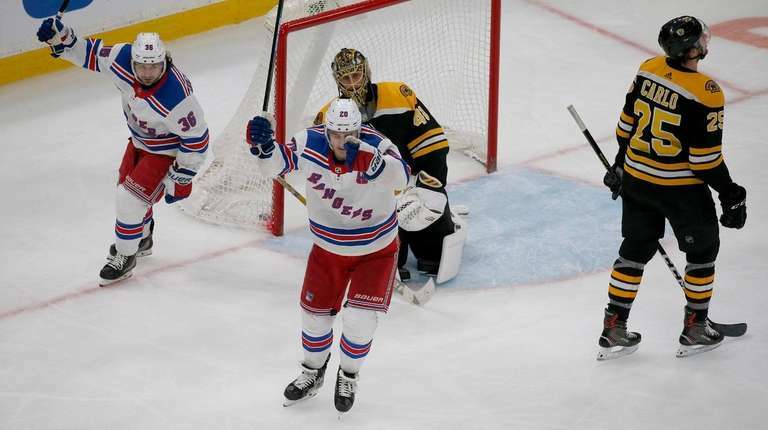 All things considered, the Rangers left Boston on Saturday night feeling pretty satisfied with the way they are playing. Mika Zibanejad’s two goals and a 5-for-5 performance by their penalty-killing unit led to a 3-2 win over the Bruins. The Rangers (21-20-7) have won three straight and four of five entering their All-Star break. Beginning with a 2-1 loss to the Islanders on Jan. 10, they have played five solid games in their last six. They are nine points out of a playoff spot, but they have turned it around after starting 2019 with five straight losses. Henrik Lundqvist, who was in goal for each of the last three wins, made 27 saves against Boston and moved into sole possession of sixth place on the all-time goaltender wins list with 446. He said he was happy “for many reasons’’ Saturday night. Lundqvist was happy to win for Quinn and defenseman Adam McQuaid, a former Bruin who returned to Boston for the first time since being traded to the Rangers in September, but also because of how well the Rangers played entering the break. “I think it’s good to get a break and also reflect on why did we have a good week here,’’ said Lundqvist, who will represent the Rangers at the All-Star Game in San Jose, California, on Saturday. “[We] really paid attention to all the details in our game this week. And that’s why we’ve been winning. Special teams have been really good. But just that focus on the details, that’s what wins you games in this league, and it’s very important that we understand that. When the Rangers return from the break, they’ll start with games against the Flyers at home Jan. 29 and against the Devils in Newark on Jan. 31. Both teams are behind them in the standings, and they’ll get the Flyers on the second night of a back-to-back. So there is an opportunity to keep their winning streak going. Lundqvist said the Rangers can’t afford to look too far ahead when they return.